A preview of Power Manager 4.2 is now available. This preview marks the jump from 4.1 to 4.2, which for Power Manager is notable. We released 4.0 in 2010 and version 3.0 in 2005. I want to take this opportunity to walk through some of the coming changes in Power Manager 4.2. Everything we talk about here is available in today's preview and ready to try right now. We tread carefully with Power Manager. Stability and consistency tend to outweigh the pressure to add the latest seasonal features and fads. So any significant change is worth a little extra effort to explain and delight in. You can now view the scheduling engine's state from the Power Manager application. The engine state tells you which events active and which events are queued up for a future date. Information that was once only available through the status menu is now accessible in the application. From within Power Manager, you can see queued, on-demand, and performing events. Events can be triggered, adjusted, and interacted with, and the changes are immediately visible. This improvement means the status menu is no longer essential. We still recommend keeping the status menu around but if you want to hide the Power Manager status menu, use the Scheduler > Status Menu Options… menu item. We have added AppleScript support to the Power Manager application. The standalone Power Manager Scripting application has been superseded in this update. The updating process does not remove the existing standalone AppleScript application. Your existing scripts and workflows will continue to work as they always have. tell application "Power Manager Scripting"
The AppleScript guide included with Power Manager has also been updated. If you need more examples or want to learn more about using AppleScript and Power Manager, the guide is the best place to start. The guide is available through the Help > AppleScript Guide menu item. Power Manager's command line tool, pmctl, has been moved. In the spirit of keeping our footprint on your Mac as small as possible, pmctl now lives inside the Power Manager application. A saving of three characters! This change also means you can use pmctl without needing to install the scheduling engine. Power Manager 4.2 introduces a new look and feel for the main application. Power Manager started life as a System Preference. We embraced the constraints of a System Preference and did well. Since moving to a full application in 4.1.3 we have not taken full advantage of our new freedom. With 4.2 we are beginning to take advantage of being an application. This update cleans up the look and feel of the main window. Gone are the numerous buttons and widgets. They have been moved to menu items – complete with keyboard shortcuts – and toolbar items. This more restrained look sits better within the OS X we have today. One metric we used when redesigning the interface was to question how each change would affect technical support. Previously, I ended up having to describe where in the window specific interface elements were. A lack of menu items and corresponding keyboard shortcuts were part and parcel of a System Preference. The most notable element to describe was the Actions (cog) pop-up. This was a clunky experience for both us and you. Those days are behind us with this update. With 4.2 we made sure that our most commonly referenced elements had menu items that could be described clearly and unambiguously. We will continue to refine the look and feel. These changes are leading towards other significant features. Being able to easily expose new features in the application was important and this is our first big step towards that goal. Prior to 4.2, Power Manager needed a restart after being installed. With 4.2, no restart is required when setting up or removing Power Manager. This makes updating to the latest version much easier. Power Manager 4.2 is now distributed as an application. The scheduling core still needs to be installed but this is now handled through a series of guided in-application steps. 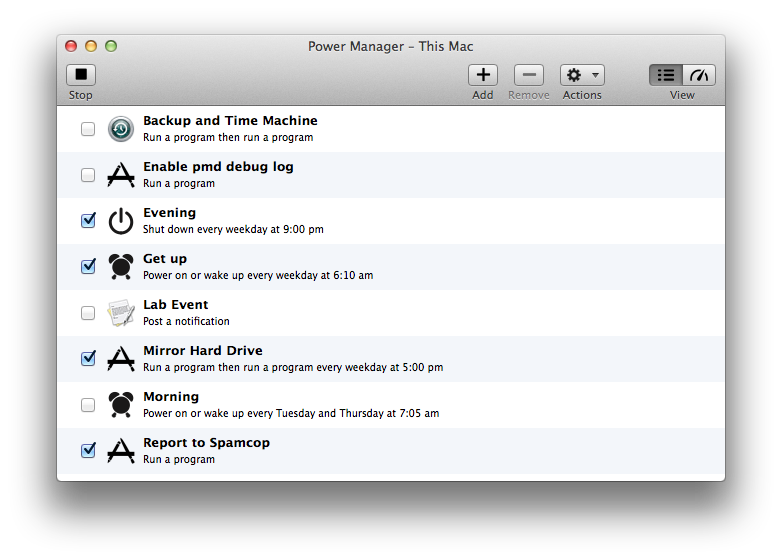 Launching Power Manager for the first time will result in a prompt or two. Following the prompts leads to a fully installed application and scheduler. Deploying applications that require guided steps is not suitable for managed environments. Schools and businesses require Installer packages that can be deployed using standard tools and techniques. For you, we continue to offer a fully packaged edition of Power Manager. Installing the package will put everything in the right place and ensure that Power Manager is up and running after restarting. The Installer package edition, .pkg, will be freely available to download for those who need, want, or prefer it. We have worked to make Power Manager more resilient to deployment mistakes. If a required launchd job is stopped or accidentally removed, Power Manager will notice and ask to repair the scheduler and required jobs. Completely removing Power Manager continues to be straight forward. Within the Power Manager application, use the Scheduler > Remove Scheduler… menu item to completely uninstall the scheduler. If you happen to remove the Power Manager application but forget the scheduler, do not panic. When you next log-in, you can use the status menu to begin the removal process. The status menu now notices if the Power Manager application has been removed. If the application is missing, the status menu will show an option to remove Power Manager. A removal tool continues to be installed along with the scheduler in the /Library/Application Support/Power Manager/ folder. We use this location because this is where most of the installed files live. If you find yourself manually trying to remove Power Manager – which we recommend against – we hope you find and use this application first. With this update we are ending support for Mac OS X 10.6, Snow Leopard. 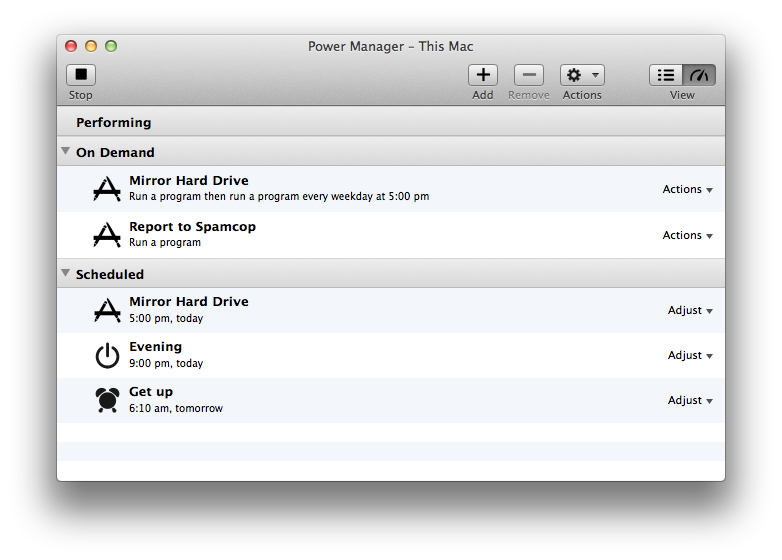 Power Manager 4.2 requires Mac OS X 10.7, Lion, or later. We continue to support the last three versions of Mac OS X with each release of Power Manager. Power Manager 4.2 is available now as a preview. If you are responsible for deploying Power Manager or you use Power Manager in a professional capacity, I recommend downloading and trying the preview right now. This will give you the best chance to discover the changes for yourself – and to get up to speed before your clients start asking questions. Trying the preview is surprisingly risk free despite it being a preview; few changes affect the underlying scheduler, with most changes concentrated in the user interface and installation process. If you encounter problems, please let us know. We are keen to get your feedback. To make sending feedback easier, a built-in feedback option is available in the Power Manager application menu. This article was posted in PM4, and Power Manager and tagged preview. Follow DssW and stay informed. Make your Mac do more! Use Power Manager at home and work. Copyright © 1997 – 2019 Dragon Systems Software Limited (DssW). All rights reserved.